International Launch Services (ILS) have launched the SIRIUS XM-5 telecommunications satellite via their veteran Proton-M launch vehicle and Breeze-M upper stage on Thursday. Lift-off from the Baikonur Cosmodrome in Kazakhstan was on schedule at 18:53 GMT, ahead of over nine hours of flight until the spacecraft was successfully placed into orbit. The Breeze-M upper stage is the Phase III variant, with Thursday’s launch being the fifth flight of the new configuration for the avionics bay. The Phase III upgrade uses two new high-pressure tanks (80 liters) to replace six smaller tanks, along with the relocation of command instruments towards the centre – in order to mitigate shock loads when the additional propellant tank is being jettisoned. The Proton M launch vehicle, utilizing a 5-burn Breeze M mission design, will lift off from Pad 24 at Baikonur Cosmodrome, Kazakhstan, with the XM-5 satellite on board. 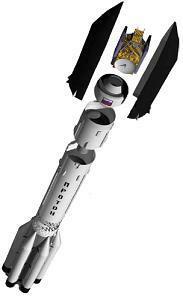 The first three stages of the Proton will use a standard ascent profile to place the orbital unit (Breeze M upper stage and the XM-5 satellite) into a sub-orbital trajectory. From this point in the mission, the Breeze M will perform planned mission maneuvers to advance the orbital unit to a circular parking orbit, then to an intermediate orbit, followed by a transfer orbit, and finally to a geosynchronous transfer orbit. Separation of the XM-5 satellite is scheduled to occur approximately 9 hours, 12 minutes after liftoff. XM-5 is a high-power geostationary satellite from SIRIUS XM Radio. XM-5 is intended to serve as an in-orbit spare for the existing fleet of SIRIUS and XM satellites. It will ensure SIRIUS XM’s array of audio and data services are reliably delivered. XM-5 will help with the delivery of more than 130 channels of commercial-free music, premier sports, news, talk, entertainment, traffic and weather to close to 20 million subscribers, as well as services such as XM NavTraffic, which provides real-time traffic information to vehicles in markets across North America. The satellite sports two large, unfurlable mesh antennas. It also has an end-of-life power capability of over 19.5 kilowatts, and is anticipated to have a service life of 15 years. The launch was the ninth Proton launch in 2010, the 360th overall. It was also the 62nd ILS Proton launch, and the sixth ILS Proton launch in 2010. The mission – when completed – will be the fifth SIRIUS XM satellite launched on an ILS Proton, and the 16th Space Systems/Loral Satellite to be launched on a Proton.